Your wedding day is one of the most important days of your life. We will ensure that on your special day, your dreams turn into reality. 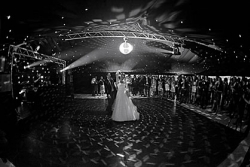 Our Wedding Discos and DJs combine professional equipment with experienced staff. 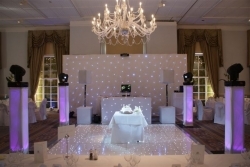 We have many disco packages available from all white wrapped equipment, which avoids the potentially unwanted look of black speaker boxes, as well as simple uplighting and a useful wireless microphone for speeches. Most of our Wedding DJs are based with us in Oxford and London and they also play at nightclubs and bars all over the UK. They also come suitably dressed for the occasion in either suit trousers and smart shirt, a suit or even a morning suit if desired to suit your requirements. Sophisticated, glamorous and stunning, our wedding planners can assist with every aspect of your day, leaving you to relax with your family and friends. We can arrange everything from booking the venue or providing the marquee to catering, bar services, the photographer and even our make-up artist for the bride and mothers of the bride & groom. We tailor our wedding packages to suit the individuality of every couple. Whether you’re after a full wedding planning service, one of our event services or simply a few hours of inspirational advice, we offer unrivaled personal attention and exceptional service. "Nikki and I would like to thank you so very much for all you did for us over our wedding weekend. Your input was brilliant, it made such a difference to the atmosphere and it was just what we were looking for. The dancing didn't stop right through the evening and that's a measure of a successful night’s work!" Would you like your first dance to be just that little bit different...? Ask us about some of the mashup's we can produce for you. Recent wedding mash-ups have included 'Everything I Do' by Bryan Adams mixed into 'We Speak No Americano' by Yolanda Be Cool, 'Only Girl In The World' - the Boyce Avenue version blended into Rihanna's original and Coldplay's 'Paradise' vs Katy Perry's 'Firework'!